The story of Webbcraft is quite a long one, if you wish to read it click here. Click here to read a bit about the history of the server. The Mushroom Co. 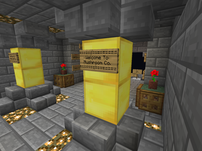 Survival server is a small friendly community that caters for any minecraft playing style. We have many plugins such as Factions so you can create a faction and build towns and bases with others, as well as ChestShop so you can create your own shops. Our aim at Mushroom Co. is to provide the best server experience for any player. We have a pvp arena for those who enjoy Player vs. Player combat, and a shop where you can buy and sell or trade with other players. 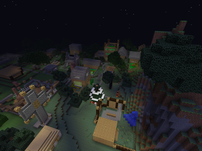 Recently, survival games has been introduced to the server and has been a moderate sucess! This is a freebuild survival server, just go out into the wilderness and claim whatever land you wish to survive on; build a house, mine deep underground, become a humble farmer or do whatever you want as long as it doesn't ruin the experience for other players. A list of rules can be found below and on the rules board at the server spawn. The official rules page with simple layout of only the rules can be found HERE. The underlying rules are: Be respectful, Be Ethical and Use Common Sense. By playing on the server you agree to follow and abide by these rules; failure to do so will result in the appropriate punishment (mute, kick, jail or ban). The staff reserve the right to discern what punishment is suitable for breach of the rules; if you feel you have been unfairly punished or are unhappy with the way staff are handling issues, please contact us. Below are donator and staff specific rules. As a donator or member of staff you agree to follow these rules; failure to do so will result in the possible removal of your donator or staff rank. The server IP (hostname) is mc.webbcraft.co.uk. The numeric IP is 89.34.96.9. Only use the numeric IP temporarily if the hostname is down as the numeric IP may change. The hostname, however, will never change and though the numeric IP may be better in the short term the hostname is always better in the long term.